Feels like I have been really neglecting my blog lately. Just been so darn busy trying too make to many things before Christmas. Right now I'm in the middle of making my mom her Christmas gift. I had the hardest time understanding this pattern correctly which I started over again and again and again, until I realized my problem was not doing the hdc2tog correctly. Ugh! That damn hdc2tog, shame on you!! Besides making gifts, I've been busy sewing some yoga bags for Thrive Naturally. I should change my description right now "Crocheter by day, sewer by night". Did you ever realize that sewer(one that does sewing) and sewer(the pipes were our poop and pee goes) are spelt the same? Hahaha! 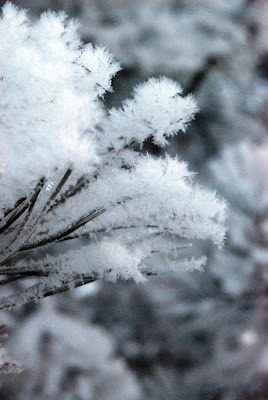 It is super gorgeous outside with all the winter frost. Time to take a breather. What was the pattern you were making? I really like the stitching. It's the Szechuan sweater from Interweave crochet fall 2009 magazine. The sweater is gorgeous.